Congratulate the happy parents on such a wonderful occasion in their family! Using the right words to wish a new born baby will go a long way in creating a lovely memory for both the mom and dad as well as become a lovely keepsake in years to come. Let your message ignite the amazing feeling they are already experiencing. Here is a nice collection of newborn baby girl wishes to parents with images. 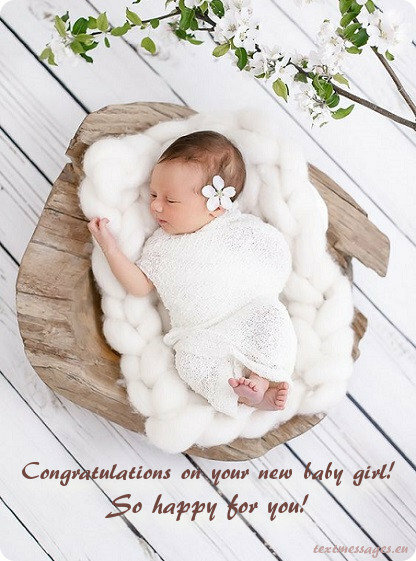 May your new born baby girl be the angel you have always wished for. May she bring into your life the happiness, pure and prosperous days! Becoming a parent is the amazing time when all life’s battle becomes truly worthy of fighting for. Congratulations to you, wonderful dad and mom! Childbirth is one of the most meaningful events in every person’s life. Giving a birth to a tiny, little fragile creature means extension of yourself. It means hope for a better future. I congratulate you on the baby! A little baby is a big happiness. First steps, first words, first experience… You’ll also go through all these stages together with your kid and you should be ready to support your child in everything. Congratulations on the baby! Being baby is simple – all you have to do is to sleep, eat and play. But being good parents is not that easy, because you’ll face many difficulties while raising your child. You have to be patient. Congratulations! So sweet, so cute, so precious. Tiny hands and the most adorable eyes. Charming smile and endless giggles. All this and lots more makes life a place worth living, welcome to the world! When we were small kids, we dreamt about all these adult things like getting married and having our own kids. But now it’s not a game – it’s a real life. And I believe that you still have to keep your inner child, because it will help you to understand and to raise your own baby. Congratulations! May the soothing smile and awesome laughter on your baby’s face be a spike of happiness in your life, Congratulations to you for becoming a parent. 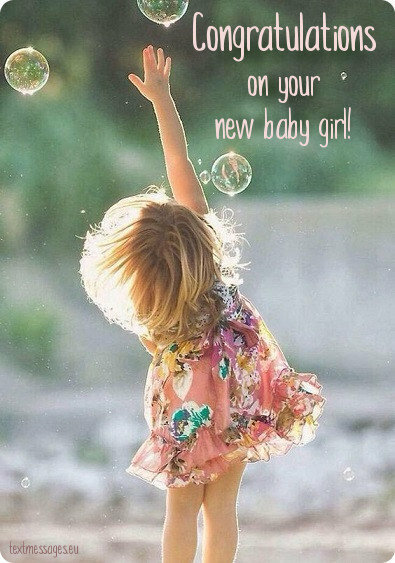 The birth of your new lovely baby will bring into your life a new phase. Now you are not just a husband and wife, but a responsible father and a loving mother. Congratulations! No matter how many years come by and whatever they grow up to be, no one can understand her children more than the mother. Congratulations because you are now one. You are just the true definition of mother’s nature perfect brew. On my behalf, tell your lovely baby that there can never be a family as awesome as yours! 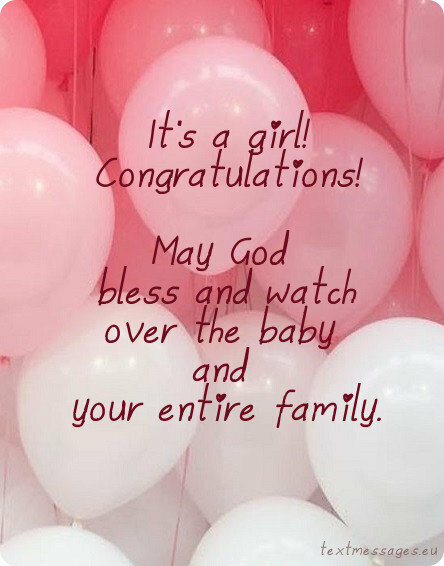 Congratulations on having a wonderful baby girl! It’s a miracle and a true blessing, you know, not everyone can have kids, and because you did, you truly are blessed, good luck to you! Congratulations, I hope you’re looking forward on waking up in the middle of the night to hers crying, to have nights with no sleep, to be grumpy, but it’s all worth it, because you get to see your baby’s smile, and that’s all that matters! So you finally had a baby, I never really thought you will, because you always used to say, that it’s a lot of work. Probably most of the women speak just like that, before they get pregnant. Lots of luck to young parents! Giving birth to a baby is such a thrill! It’s a huge responsibility, but at the same time it’s a pure happiness, a blessing. Appreciate and love this gift with all your heart. Congratulations on the new baby! I remember, like it was yesterday… you said you really wanted a girl, a little princess, and now, you have your wonderful baby girl in your hands. You two are really blessed! I actually never thought that you will have a kid, but since you did, I couldn’t be more proud of you two, I know you will raise him right, you know we have your back and support you all the way, with any decision you make. Starting from now your life will be filled with cheers, because the former two of you will now become three musketeers. Congratulations to you, the latest parent in vogue. You guys finally had a baby! I’m so proud of you, and I wish you the best of luck raising him, I know he will be a good kid, just like you will be wonderful parents, good luck, and if you need anything just ask! 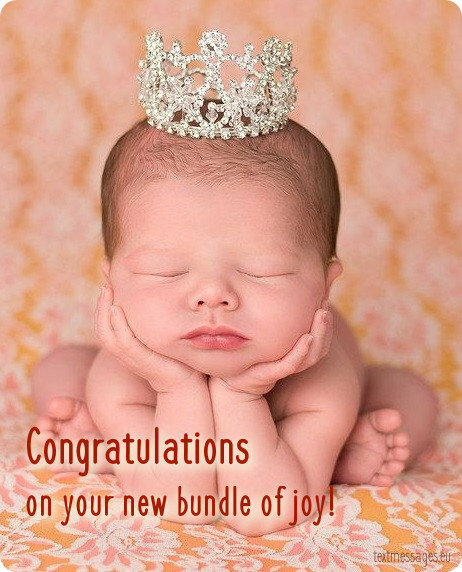 Congratulations on your new baby! I believe he lives a healthy and wonderful life, because I know you will be great parents, I’m so happy for you and I wish you all the luck in the world! Many young parents suppose that it is them who are able to explore and discover the world for their kid, but that’s not exactly true. You’ll be surprised to find out that your baby will open even a bigger world for you. Congratulations on the baby! They say that children are the flowers of our lives. But I would say that it depends on the way how parents treat and raise them. I’m sure you’ll bring up a nice child, because you’re nice people. Congratulations! You always said: “I never want to have kids, they are so much work!” but look at you now… you have a wonderful baby. I’m so proud of you, for doing such a big step in your life, good luck! Now that you have finally become a parent, you will realize that life isn’t a race but a beautiful journey worth cherishing. Have fun while you cuddle your little one in your arms day and night. Congratulations!